This is one of the hottest topic in Real Estate today. For people receiving Social security income looking to own a home, this video will help you take your first step in owning that dream home. Patrick: Hello and welcome, guys, to The Real Estate Stew with the What's Cookin' crew. I'm Patrick. Kiesha: And I'm Kiesha. Always nice to see you guys. Patrick: Guys, today we're going to check and see what are some of the hot, hot questions going on for us in this pot. Kiesha, help me out. Kiesha: Yes I will. Let's see. Patrick: Stir it up. Stir it up. Kiesha: I know, I keep getting more than one here. Let's see, okay. I can tell this is a good one. 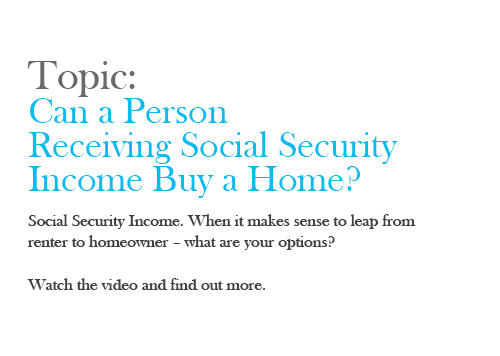 This viewer wants to know, can a person receiving Social Security income buy a home? Patrick: Oh wow. Yeah, excellent. I get that one a lot. Kiesha: Great question. Well, I think the important thing to do, starting off, is to make the distinction between types of Social Security income. First we have retirement income, and then we have disability income. Disability income can be one of two types, either permanent or temporary. For the lender, the lender likes income that's predictable. Retirement income and permanent disability income are always going to work when you're trying to qualify for a mortgage. The lender could use that as they would any regular income to calculate what you can afford to purchase. Patrick: Now, another thing, guys, that's very important, too, when Kiesha mentioned permanent, she mentioned temporary, is understand that whenever you're applying for a loan, one of the most important things to a lender is knowing that that income is anticipated or expected to come in for a period of time. Patrick: Keisha, the period of time that you need to be mindful of is at least three years. Kiesha: With temporary income, even if you have ... You can verify through the Social Security Administration that you'll be receiving it for at least three years, oftentimes the lender can still use that as they would the retirement income or the permanent income. Kiesha: Yeah, and they think they can't buy. Patrick: They think they can't ... Guys, listen. First of all, Social Security income, guess what, it shows up every month, on time, blizzard, storm, hurricane, whatever. That money shows up in your account. Why? Because we're not depending on the mailman, the USPS to deliver it. It shows up electronically. That's a huge plus lenders love that. What else? Kiesha: The other thing is, it's not going anywhere. Those of us that go to work every day, you could end up losing a job. The business could go out of business. One thing about Social Security is you have none of those things to worry about. Patrick: Guess who provides it. Patrick: Hey. We're not gonna say anything else about that, other than the government. We expect them to be around, right? Kiesha: For a very long time. Patrick: Guess what, they're gonna be around a long time, and guess what else is gonna be around a long time. Patrick: Your Social Security check. That's right. Again, all of these things are huge. You know what, the one thing that I wanna make sure that you guys understand is this. With Social Security income, I get this a lot, Mr. King, I make 1,500. Mr. King, I make 800. Mr. King, I make 2,000. I just don't think that's enough. Here's something I want you to go. With Social Security income, there's certain lenders out there ... That's a huge question. Write that down, you guys. I want you to go out and ask the lenders, if you're considering purchasing with your Social Security income, say, "Hey, I have Social Security income. Do you gross up?" Write that down. Gross up. Now, why are you asking that? Because, if the lenders gross up, and you only wanna work with the ones that do, in my opinion, because if they gross up, let's use $2,000.00. If you have $2,000.00 in income a month, in your awards letter, that's where you'll find ... some of you were saying Mr. King how do we know? Your awards letter is what they go by. You wanna have that. Take your awards letter, see what amount is on there. Let's say it says 2,000. What you'll do is think of 100. You have 100. You're going to subtract ... let's say you wanna gross up 30, 40, and in this case, 25%. Because with SSI, Social Security, you can gross up 25%. You take your 100, you subtract 25 from it. That equals what? Seventy-five, and you wanna put a percent sign, so 100 minus 25 equals 75, so that means we're going to use 75 to calculate a 25 percent gross up. You take your check amount, the $2,000.00 for Social Security, you divide that by 75%, and I will tell you what you're going to get. You're going to get $2,666.67. That is now the amount that the lender is going to use as your income, guys. That's huge. Do you realize you just went up $666.67? That's huge. Very important to know. I want you all to remember that, gross up. Kiesha: ... of Social Security income. It does give you a little bit of an edge. When the lender is ready to calculate your debt to income ratio, and that's the number that they're gonna use to determine how much of your income is allocated towards certain debt. When they're calculating your debt to income ratio, they're gonna use the full $2,666.67 as Patrick gave in that example as your full income and calculate your debt to income ratio based on that. Patrick: Of course, guys, you're gonna hear things like front-end ratio, back-end ratio. We'll get into all of that in subsequent videos, etc, so we definitely encourage you to tune in. I would say, Keisha, for those of you that were wondering about Social Security income and the ability to purchase with Social Security income, absolutely. Patrick: Absolutely. Listen. Always, always, always pursue the goal of home ownership. Whether it's Social Security income or not. With that being said, Keisha, there's always that question. Was that a hot topic or not? Was it? Here's how we like to distinguish. Watch this. Patrick: Oh, she just gotta wear it too. For those of you that follow the What's Cookin' Crew. We have our white and our red hats. When we pull out the red hats, guys, that means what, Keisha? Kiesha: The topic was hot. Patrick: Hot. Social Security is a very hot topic. Thank you guys for asking. Listen, until next time, remember definitely subscribe, definitely comment, and most importantly, like the video, guys. Patrick: Questions@whatscookincrew.com, see you next time.